The Navy SEALs who killed Osama bin Laden on May 2, 2011, learned from ABC News that they had “gazelle legs, no waist, and a huge upper body configuration,” not to mention calloused hands and gigantic egos. They learned from other American news sources that they had taken part in a 45-minute firefight and that an armed bin Laden, once cornered, had tried to defend himself in his final moments, staring straight at the fighters who would shoot him. Their raid was being turned into a bad action movie. These distortions seemed funny at first. But “Mark Owen” (the pseudonym of one gutsy, transgressive member of the SEALs, who served 13 consecutive combat deployments) began to want to set the record straight. He hoped to deliver firsthand a visceral and often surprising version of the bin Laden raid and other SEAL stories. The emphasis of his “No Easy Day,” written with Kevin Maurer, is not on spilling secrets. It is on explaining a SEAL’s rigorous mind-set and showing how that toughness is created. 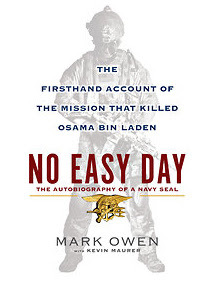 The bin Laden story is the marquee event in “No Easy Day,” of course. But the formative steps in the author’s own story are just as gripping. In a prologue the author, who grew up in Alaska and earned his SEAL Trident in 1998, writes about reading a book about SEALs (“Men in Green Faces” by Gene Wentz) as a junior high school kid, realizing that this was his vocation and hoping that he too could one day write a book that would inspire others. Mission accomplished. “No Easy Day” gets off to a worrisomely formulaic start: A pumped-up prologue on the flight to the bin Laden compound in Abbottabad, Pakistan, then a potentially dull flashback to the author’s early SEAL training. (“If I failed the situps, I was done.”). But it quickly becomes an exciting, suspenseful account of how his fighting skills were honed. In the first contentious days of this book’s arrival the author’s real identity has been outed: He is Matt Bissonnette, and the Defense Department has threatened to prosecute him for violating confidentiality agreements. But his book is careful to avoid all but the most basic information about his SEAL experiences, and its emphasis is on the close-up experience of a team member in action not on the big picture policy questions that determine how he has been deployed. That basic material is hugely illuminating in its own right. Just by describing the model of a kill house in which he trained to raid buildings, he conveys the ferocious pragmatism of SEAL thinking. Years ago, in Mississippi, he repeatedly raided this modular structure, which could be reconfigured as conference rooms, bathrooms or even a ballroom. “We rarely saw the same layout more than once,” he says. Meanwhile instructors overhead on catwalks watched the trainees perform, eliminating the group’s weaker members as if they were failed contestants on a reality show. Mr. Owen made one false move that might have gotten him booted out during such exercises. He learned never to make it again. While deployed in Iraq (though most of his service was in Afghanistan) he was part of a team in Baghdad that mistakenly landed on the wrong roof. The raid’s target is discreetly identified as “a high-level weapons facilitator, just another link in the chain funding the insurgency.” The book describes how quickly the team adapted to turn the error to its advantage and speculates about how much worse the outcome would have been had it hit their original landing site. What he gained from this experience was a healthy understanding of the importance of luck. For the tightly controlling Type-A personality that is apparently common to some members of the SEALs this was humbling indeed. Although “No Easy Day” gives a strong sense of SEAL camaraderie and even the team members practical joking (who knew they could be punked with glitter? ), the author’s fellow fighters are identified strangely at best. One is said to have a big head. Another has “hands as big as shovels.” A third resembles a taller version of the dwarf Gimli from “The Lord of the Rings,” and that’s about it for distinguishing characteristics. Before the bin Laden mission, the author says, he was present at the 2009 SEAL rescue of Richard Phillips, the captain of the cargo ship Maersk Alabama, from the hands of Somali pirates. It is only after the George W. Bush presidency that the author begins complaining about the slow-moving “Washington machine” that members of the SEALs found frustrating. That irritation mounts in 2011, when the SEALs anxiously awaited their signal to raid Abbottabad, but this account is determined to steer clear of serious politics or leave itself open to election-season manipulation. The worst it has to say about President Obama is that none of the fighters who caught bin Laden wanted to help re-elect him, and that he never followed through on a promise to invite them to the White House for a beer.